OBD Dongles « Global Market Insights, Inc.
Powered by a strict regulatory frame of reference formulated to control vehicular emissions, on-board diagnostics (OBD) aftermarket has emerged as a highly lucrative business sphere over the last few years. Lately, many regulatory bodies have established emission control facility centers to resolve the issues related to the effective working of OBD. In the U.S. specifically, the National Center for Automotive Science & Technology has established the National OBD Clearinghouse for facilitating the understanding of the on-board diagnostics technology, for which U.S. Environmental Protection Agency (EPA) has even provided a grant. In order to comply with the Clean Air Act, EPA has been encouraging people to conduct vehicle maintenance and inspection that will ultimately control the vehicle emission. As of now, a majority of vehicles are incorporated with the OBD technology for meeting the national air quality standards. The OBD system is one of the integral parts of the electronic control unit (ECU) and is used for diagnosing and repairing vehicle subsystems and rectifying the malfunctions associated with the systems. The integrity of the emission control unit is maintained with the help of external tools that re-flash and re-configure the vehicle emission parameters. The increasing use of external vehicle diagnostic tools to maintain the shelf life of the vehicle is slated to propel on-board diagnostics (OBD) aftermarket considerably. Taking into account the strict regulatory norms formulated to curb and monitor vehicle emissions, many diagnostic equipment providers are currently developing new OBD tool facility centers to check problems associated with the engine. For instance, in 2017, the leading suppliers of test equipment and diagnostic reporting for the automotive aftermarket, Innova Electronics Corp launched a modern on-board diagnostic tool line which is totally featured with its newly invented products that will be helpful for excellent diagnostic reporting. 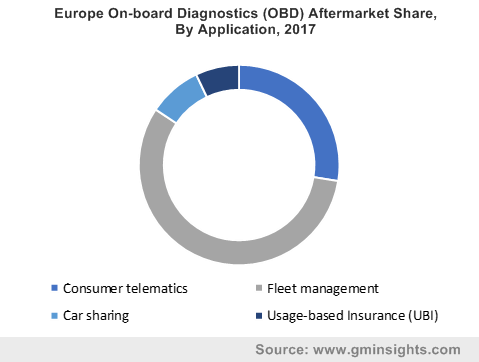 The advent of a new range of technologies including cloud computing, Internet of Things (IoT), and smartphones have also had a remarkable influence on the on-board diagnostics aftermarket. In line with the recent product launches, many on-board diagnostics (OBD) aftermarket contenders have been developing new product portfolios comprising the modern technology aids. It has become very easy now for the vehicle owners to calibrate their vehicles’ emission control unit. Recently, one of the leading players in on-board diagnostics aftermarket, Verizon has launched a next-generation aftermarket vehicle diagnostic service device that works just by plugging into vehicle’s OBD computer port. As soon as it does, it connects to the OBD system of the vehicle and notifies the driver about any maintenance issue. In addition, Verizon has incorporated a smartphone software application as well as GPS technology that will help to resolve the mechanical issues in case of an emergency. Though the government has mandated the deployment of vehicle health monitoring facilities, many vehicle owners are disabling and tampering on-board diagnostics and pollution control systems. They have also been tampering with laboratory test results and are bypassing emissions around monitoring devices. In U.S., the criminal office of the Environmental Protection Agency (EPA) and the Department of Justice (DOJ) in fact, had sued the employees of Rockwater Northeast LLC which provides operational services across oil and gas sector. The employees of this hydraulic fracturing firm had modified the OBD system and emission control unit of the company’s heavy-duty diesel trucks. This strict stand taken by the regulatory bodies for the infringement of Clean Air act has depicted the significance regulations have on the North America on-board diagnostics aftermarket industry growth. The significant benefits associated with the deployment of on-board diagnostics system to improve air quality through vehicle maintenance and inspection is slated to fuel the product demand across the globe. The installation of vehicle health inspection systems ultimately helps the owners to maintain the vehicle before it violates the air quality standard set by the government. In this regard, many vehicle owners have been implementing OBD systems to monitor and maintain their vehicles which will favorably stimulate on-board diagnostics aftermarket industry size over the years ahead. For the record, driven by a strict regulatory frame of reference, the overall on-board diagnostics (OBD) aftermarket will surpass revenue collection of USD 1.5 billion by the end of 2024. This entry was posted in Sustainable & Smart Technologies and tagged Apps, Car Sharing, Consumer Telematics, Fleet Management, Heavy Commercial Vehicles, Integration & Maintenance, Light Commercial vehicles, Managed Service, OBD Aftermarket, OBD Dongles, OBD Scanners, On-board Diagnostics Aftermarket, Passenger Vehicles, PC-based software, Training & Consulting, Usage Based Insurance.